Meditation is the key which unlocks the treasure-trove of the highest intelligence, of wisdom, of divinity, of genius. No man who wishes to make a success of his life can afford to neglect it. The genius among scientists, the successful business-man, the best among philosophers, the Yogi and the seeker after Truth, all of them meditate. Their achievements are the fruits of their meditation. 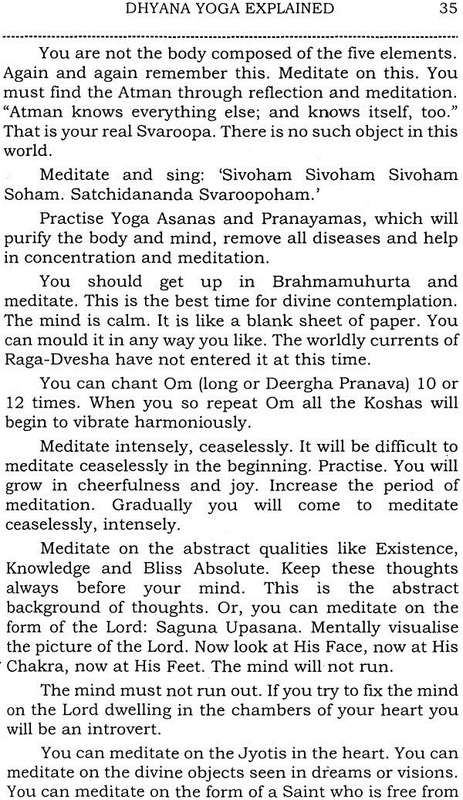 The secrets of meditation have remained the close preserve of Yogis, till the Sage of the Himalayas, Sri Swami Sivanandaji Maharaj, in his supreme compassion all-consuming love for all mankind, came forward to elucidate the philosophical foundation, the method, the experiences, the obstacles and the successful fulfillment of meditation. Dhyana or meditation is in the keeping up of the flow of one idea with a continuity as unbroken as the flow of oil. Meditation is of two kinds, viz., concrete and abstract. If you meditate on any picture or concrete object it is concrete meditation. If you meditate on an abstract idea, on any quality such as mercy, tolerance, it is abstract meditation. A beginner should practise concrete meditation. For some aspirants, abstract meditation is more easy than concrete meditation. The practice of meditation must start only after one is well established in Pratyahara or abstraction of the senses and concentration. If the senses are turbulent, if the mind cannot be fixed on one point, no meditation is possible even within hundreds of years. One should go stage by stage, step by step. The mind should be withdrawn again and again and fixed upon the object of meditation. Its tendency to run and roam must be checked. One should reduce one's wants and renounce all sorts of wild, vain desires from the mind. A desire1css man alone can sit quiet and practise meditation. Sattvic and light diet and Brahmacharya are the prerequisites for the practice of meditation. Consciousness is of two kinds, viz., focussing consciousness and marginal consciousness. When you concentrate on Trikuti the space midway between the eyebrows, your focussing consciousness is on the Trikuti. When some flies sit on your left hand during meditation, you drive them with your right hand. When you become conscious of the flies it is called marginal consciousness. A seed which has remained in the fire for a second will not undoubtedly sprout into leaves even though sown in a fertile soil. 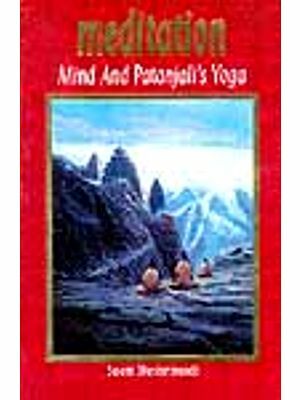 Even so a mind that does meditation for some time but runs towards sensual objects on account of unsteadiness will not bring in the full fruits of Yoga. 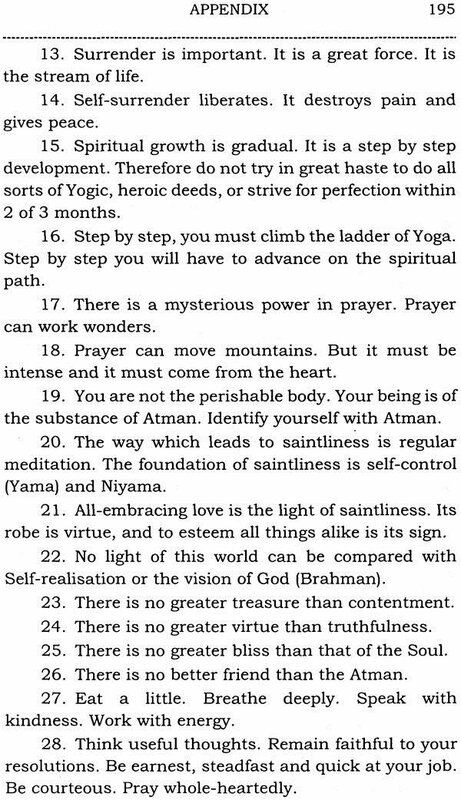 Beginners on the spiritual path should remember again and again some important and inspiring Vedantic statements, every day. Only then can their doubts be removed and they would find themselves established on the path. Some of these statements are: "Being alone was in the. 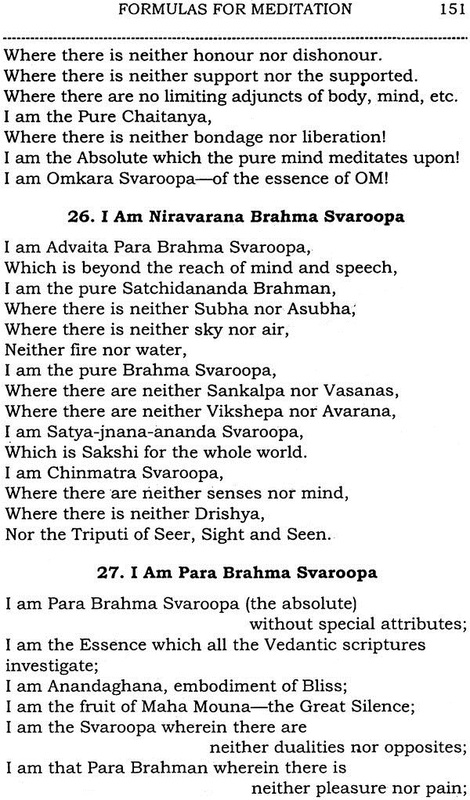 beginning, one without a second" Chhandogya Upanishad VI-2-1; "In the beginning all this was the one Self alone" Aitareya Upanishad VI-2-1; "This is the Brahman, without cause and without effect; this Self is Brahman perceiving everything" Brihadaranyaka Upanishad II-5-19; "That immortal Brahman alone is" Mandukya Upanishad, IJ-2-7. This immortal Atman cannot be attained without constant practice of meditation. Therefore he who wishes to attain immortality and freedom should meditate on the Self or the Brahman, for a long time. 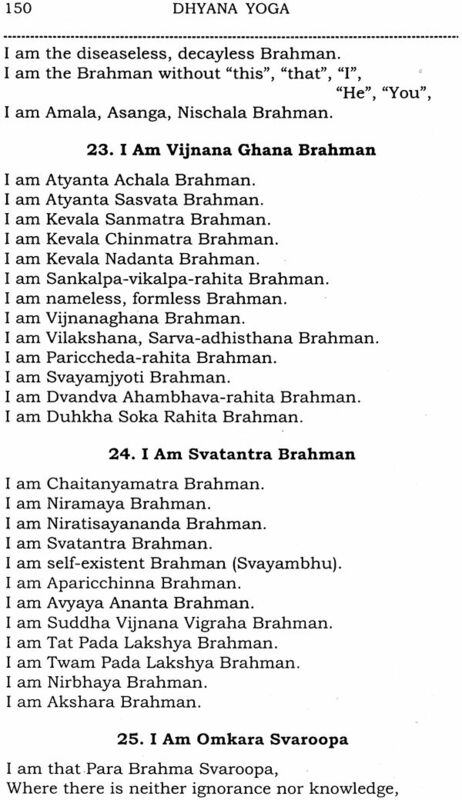 The Self or the Atman is the fountain-source of all energy. Thinking on Atman as the Source of all Energy, is a dynamic method for augmenting one's own energy, strength and power. If you think even for a single second, of the all-pervading pure, immortal Satchidananda Atman or Brahman, it would be tantamount to taking thousand and eight dips in the sacred Triveni-the junction of three holy rivers at Prayag. This is the real mental sacred bath. Physical bath is nothing when compared to this internal bath of wisdom or knowledge. Worship the Self or the Atman with the flowers of Jnana or wisdom, contentment, peace, joy and equal vision. This will constitute real worship. Offerings of rose, jasmine, sandal paste, incense, sweetmeats and fruits are nothing when compared to the offerings of Jnana, contentment, peace, equal vision. These are the offerings given by the ignorant persons. Try to identify yourself with the eternal, immortal, ever-pure Atman or Soul that resides in the chambers of your heart. 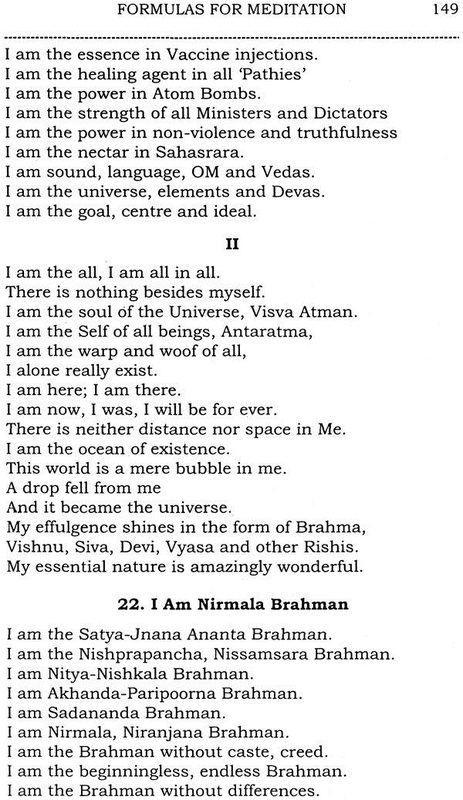 Think and feel always: "I am the very pure Atman." This one thought will remove all troubles and fanciful thoughts. The mind wants to delude you when it detracts you from the central purpose of your life, viz., meditation on the Atman. Therefore start an anti-current of thought against the tendencies of the mind. Then, mind will lurk like a thief and become submissive. In the Yoga- Vasishtha you will find: "The right course to be adopted by one who is a novitiate is this: Two parts of the mind must be filled with the objects of enjoyments, one part with philosophy and the remaining part with devotion to the teacher. Having advanced a little, he should fill one part of the mind with the object of enjoyment, two parts with devotion to the teacher and the remaining one with getting an insight into the meaning of philosophy. When one has attained proficiency, he should every day fill two parts of his mind with philosophy and supreme Renunciation, and the remaining two parts with meditation and devoted service to the Guru." This will eventually lead you on to meditation for twenty-four hours. 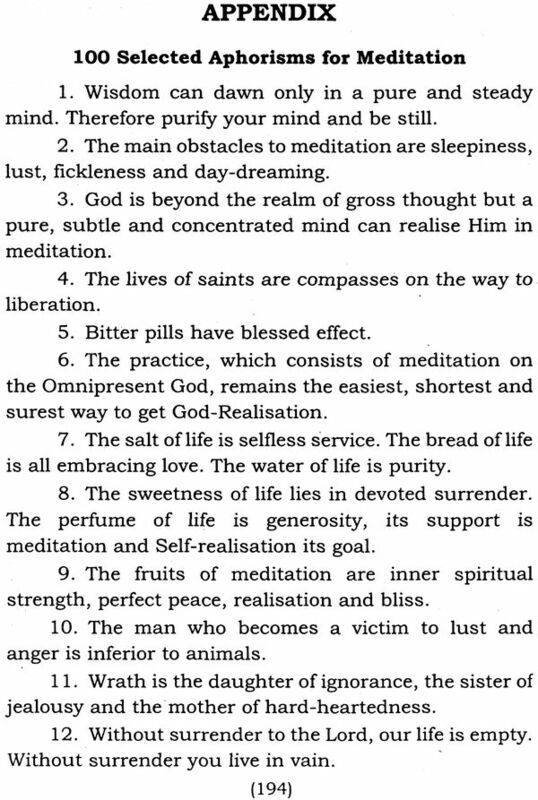 Meditate ceaselessly upon that Satchidananda Brahman and attain the Supreme immaculate seat in this very life. Concentration is holding the mind on to some particular object. An unbroken flow of knowledge in that subject is meditation. Meditation is regular flow of thought with regard to the object of concentration. Meditation follows concentration. Concentration merges in meditation. Meditation opens the doors of the mind to intuitive knowledge and many powers. You can get whatever you want through meditation. During meditation all worldly thoughts are shut out from the mind. Meditation is called Dhyana in Sanskrit and is the seventh step in the Yogic ladder. There should be a separate room for meditation and other spiritual exercises and practices. The room should be regarded as a temple of God. You should not allow anybody into the room. You should enter the room with a pious and reverent mind. Thoughts of jealousy, lust, greed and anger should not be entertained within the four walls of the room. All worldly talks also should not be indulged in there. For every word that is uttered, every thought that is cherished and every deed that is done is not lost; they are reflected on the subtle layers of ether encircling the room where they are done and hence affect the mind, invariably. Decorate the room with inspiring pictures of great Saints" Sages, Prophets and World Teachers. In a prominent place in the room keep a beautiful photo of your tutelary Deity (Ishta-Devata), either Lord Krishna, Lord Siva, Devi or Lord Jesus. Let the Deity face the East or North. Spread your Asana (seat) in front of the Deity. Keep some religious and philosophical books such as the Bhagavad-Gita, the Upanishads, the Vedanta-Sutras, the Ramayana, the Yogavasishtha, the Bible, etc., by your side. Wash your face, hands and legs before you enter the room. Burn a piece of camphor and light some scented sticks immediately after entering the room. Sit on the Asana in front of the Deity and repeat the Name of the Lord or sing some devotional hymns. Then take to the practice of concentration and meditation. We cannot seek for ideal places. Even if we wander from pole to pole, we cannot get an ideal place that will satisfy us from every standpoint. Every place has some advantages and some disadvantages as well. So you should select a place that is more advantageous than the others. Having once selected a place, you must stick to it till the last. You must not think of changing the place, when some difficulty stares you in the face. You must put up with the difficulty by all means. Rishikesh (Himalayas), Haridwar, Uttarkashi, Badrinarayan, Gangotri, Mount Kailas, Brindawan, Banaras, Nasik and Ayodhya are all excellent places for meditation in India. In the beginning you can meditate twice daily, from 4 to 5 in the morning and 7 to 8 at night. 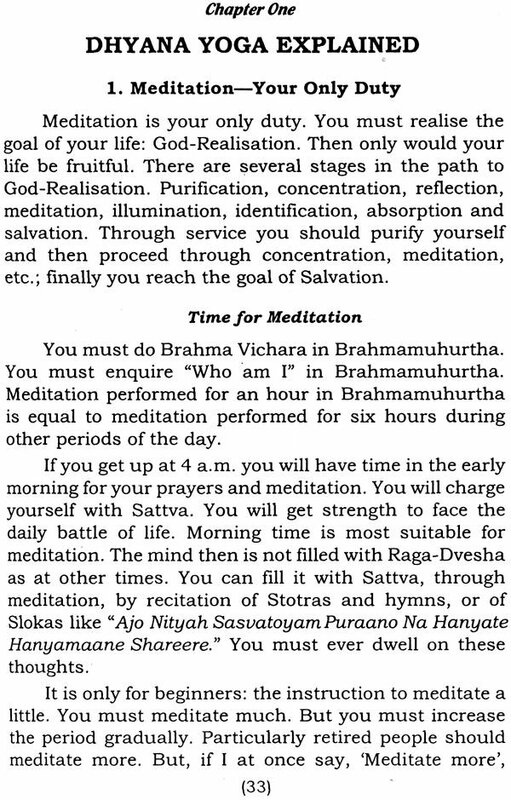 As you advance in your practices you can increase the duration of each sitting little by little using your commonsense and discretion, and also have a third sitting either in the morning between 10 and 11 or in the evening between 4 and 5. Sitting on your favourite meditative pose and keeping the head, neck and trunk erect, close your eyes and gently concentrate on either the tip of the nose, space between the eyebrows, the heart-lotus or the crown of the head. When once you have selected one centre of concentration, stick to it till the last with leechlike tenacity. Never change it. Thus, if you have chosen to concentrate on the heart-lotus after having tried the other centres, stick to the heart-lotus alone. Then only can you expect rapid advancement. Meditation is of two kinds, viz., Saguna (with Gunas or qualities) meditation and Nirguna. 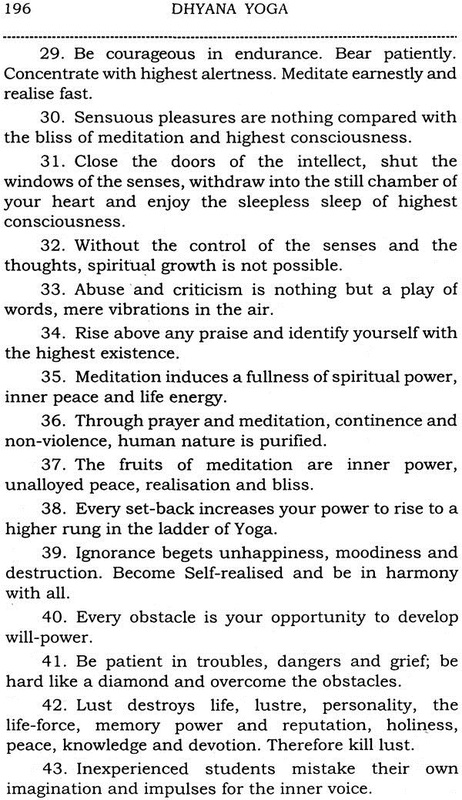 (without Gunas or qualities) meditation. Meditation on Lord Krishna, Lord Siva, Lord Rama or Lord Jesus is Saguna meditation. It is meditation with form and attributes. The Name of the Lord is also simultaneously repeated. This is the method of the Bhaktas. Meditation on the reality of the Self is Nirguna meditation. This is the method of the Vedantins. 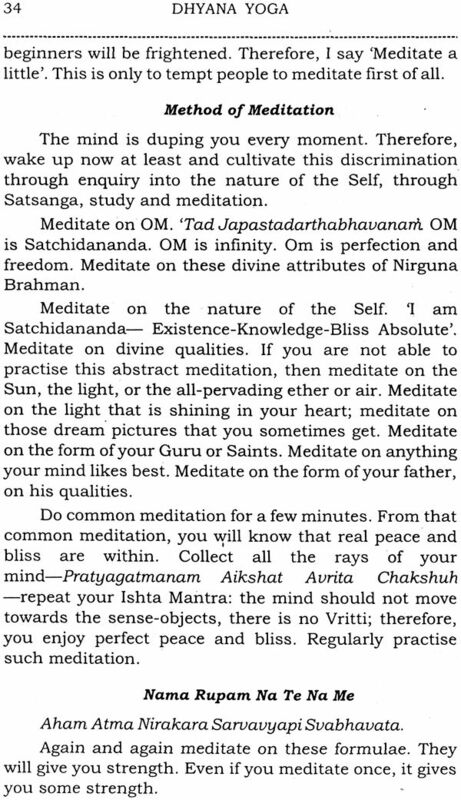 Meditation on Om, Soham, Sivoham, Aham Brahma Asmi and Tat Twam Asi is Nirguna meditation. Put an iron rod in the blazing furnace. It becomes red like fire. Remove it from the fire. It loses its red colour. If you want to keep it always red, you must keep it always in fire. Even so, if you want to keep the mind charged with the fire of Brahmic Wisdom, you must keep it always in contact with the Brahmic Fire of Knowledge through constant and intense meditation. You must, in other words, keep up an unceasing flow or Brahmic consciousness. Meditation is the most powerful mental and nervine tonic. The holy vibrations penetrate all the cells of the body and cure the various diseases that human flesh is heir to. Those who regularly meditate save the doctor's bills. The powerful soothing waves that arise during meditation exercise a benign influence on the mind, nerves, organs and cells of the body. The divine energy freely flows like the flow of oil from one vessel to another, from the Feet of the Lord to the different systems of the practitioner. If you meditate for half an hour, you will be able to face the daily battle of life with peace and spiritual strength for one week through the force of meditation. Such is the beneficial effect of meditation. As you have to move with different minds of peculiar nature, get the requisite strength and peace from meditation and be free from worry and trouble. The wise cut asunder the knot of egoism by the sharp sword of constant meditation. 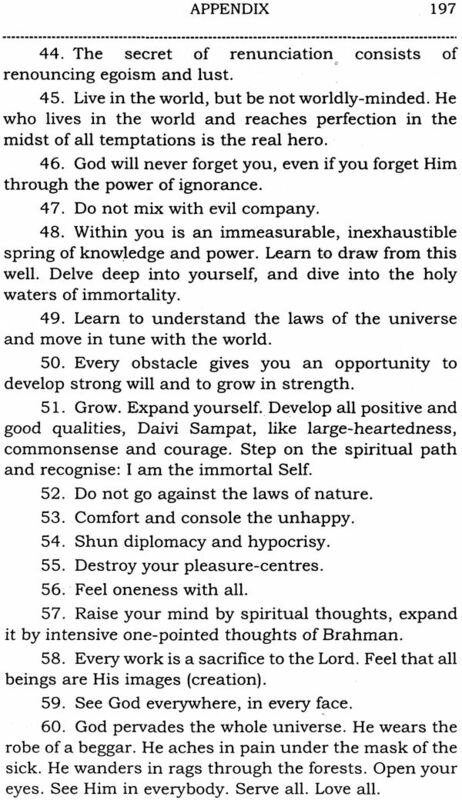 Then draw supreme Knowledge of the Self or full illumination or Self-realisation. All bonds of Karma (action) are rent asunder. Therefore be ever engaged in meditation. This is the master-key to open the realms of eternal Bliss. It may be disgusting and tiring in the beginning, because the mind will be running away from the point (Lakshya) every now and then. But after sometime it will be focussed in the centre. You will be immersed in Divine Bliss. Regular meditation opens up the avenues of intuitional knowledge, makes the mind calm and steady, awakens an ecstatic feeling, and brings the Yogic student in contact with the Supreme Purusha. If there are doubts, they are all cleared by themselves, when you march on the path of Dhyana- Yoga (meditation) steadily. You will yourself feel the way to place your footstep in the next higher rung of the Yogic ladder. A mysterious inner voice will guide you. Hear thou this attentively, 0 Aspirant! When you get a flash of illumination, do not be frightened. It will be a new experience of immense joy. Do not turn back. 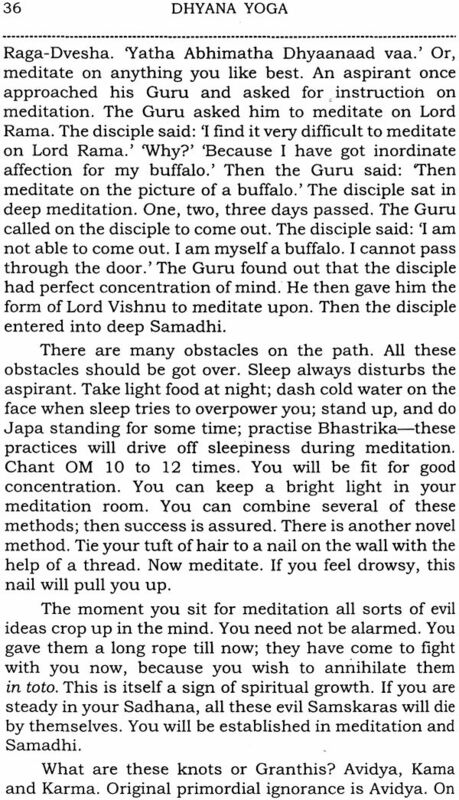 Do not give up meditation. Do not stop there. You will have to advance still further. This is only a glimpse of truth. This is not the highest realisation. This is only a new platform. Try to ascend further. Reach the Bhuma or the Infinite. Now alone you are proof against all temptations. You will drink deep the nectar of Immortality. This is the acme or final stage. You will take eternal rest now. You need not meditate any further. This is the final goal.